I was at the launch of a new spirit in WJ Kavanagh's on Thursday evening. 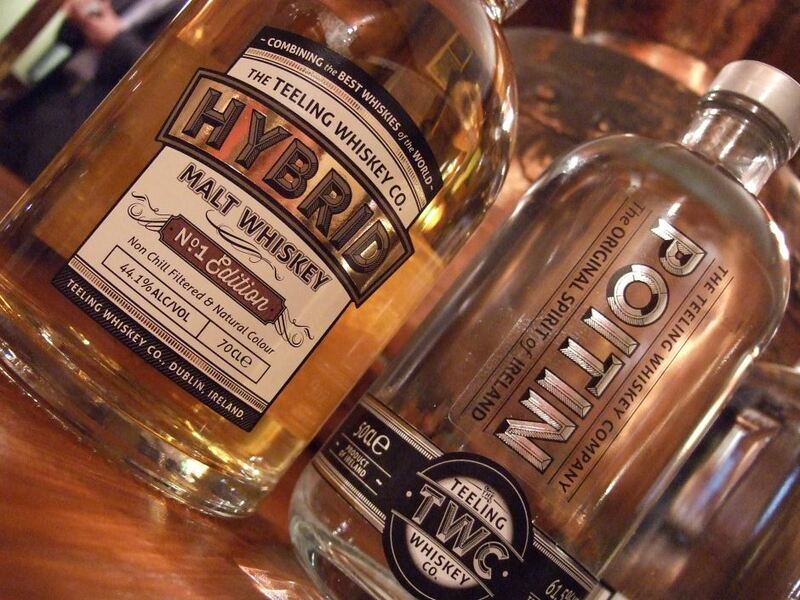 It's the second release from Teeling, the first being the Hybrid Malt Whiskey. This isn't whiskey, exactly, but poitín. That name has the same resonance in Ireland as "moonshine" does in the United States. It can be distilled from various ingredients but this one is made solely from grain, just like whiskey. Indeed, it's made at the Cooley distillery and is the same spirit that they transform into whiskey by maturing in casks for a period of years. Cooley has been down this road themselves with a single pot still poitín. That was pretty full-on and, to be honest, a little bit raw for my taste (it's for good reason we let spirit sit in oak before we drink it). Teeling have taken another approach. Their poitín is a blend of 80% grain spirit and 20% malt spirit, a proportion not untypical of a basic blended whiskey. That milder grain spirit makes it quite palatable neat, and it's gentler on the nose and tastebuds than the 61.5% ABV would suggest. On the nose I get banana bread and fresh grass. The taste is peppery with a little mint, and it develops into a lingering mild lemon cheesecake. Since poitín just doesn't exist yet as a drinks category in either the on- or off-trade in Ireland, the big questions are: who is going to drink this, and how are they going to drink it? These are open questions. Serious whiskey fans will want to sample it as an unaged "whiskey"; it illuminates the effect of oak by the complete absence of a contribution from wood. I can't guess, however, how gin and vodka drinkers will take to it. It has a flavour not easily masked in a long drink, which I regard as a positive, but might prove a challenge. The host pub for the launch, WJ Kavanagh's, perhaps pointed the way with some cocktails developed for the occasion. I tried a Jack Rose, a cocktail normally based on applejack (a distilled apple spirit). Michael Foggarty - proprietor, whiskey expert and mixologist - substituted poitín that had been macerating the pulp of apples (that he picked himself in Wicklow) for 10 days. 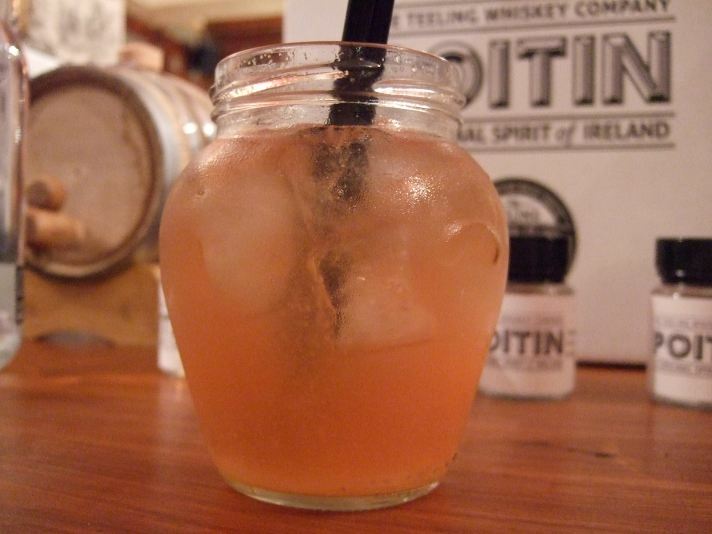 The apple purée and poitín were then combined with grenadine and apple juice. Truly delicious. There was also a "Christmas Cosmopolitan" that is on the menu at WJ Kavanagh's until the 24th of December. That's the only poitín cocktail currently available in the pub but Michael will continue to tweak his cocktail recipes and they will appear on the menu in the new year. We were also treated to various finger foods that incorporated the poitín. Both WJ Kavanagh's and its sister pub, L Mulligan Grocer, have serious gastro chops so these were, of course, very appetising. The poitín will likely continue to make guest appearances in the pubs' dishes. If the poitín is a hit then Teeling will happily keep bottling it. It goes for between €30 and €35 for 50cl, and will be available from the Celtic Whiskey Shop and Dublin Airport.